Saturday — Labor Day Classic at Palo Verde, 8 a.m. Host Palo Verde will try to defend its title in the junior-senior boys race, but there should be plenty of competition. Defending girls champ Centennial also is entered. The meet begins with the freshman-sophomore girls race at 8 a.m.
Friday — Bishop Gorman at Centennial (Arizona), 6:30 p.m. The Gaels will try to bounce back from their lopsided loss to Mater Dei (California) against one of the top teams in Arizona. Tawee Walker, who starred at Mojave last season, accounted for four touchdowns in the season-opener for the Coyotes. Friday — Sierra Vista at Green Valley, 7 p.m. The Gators are off to a 2-0 start and will try to keep the momentum against the Mountain Lions. Sierra Vista is coming off a bye week after losing to Centennial in Week 1. 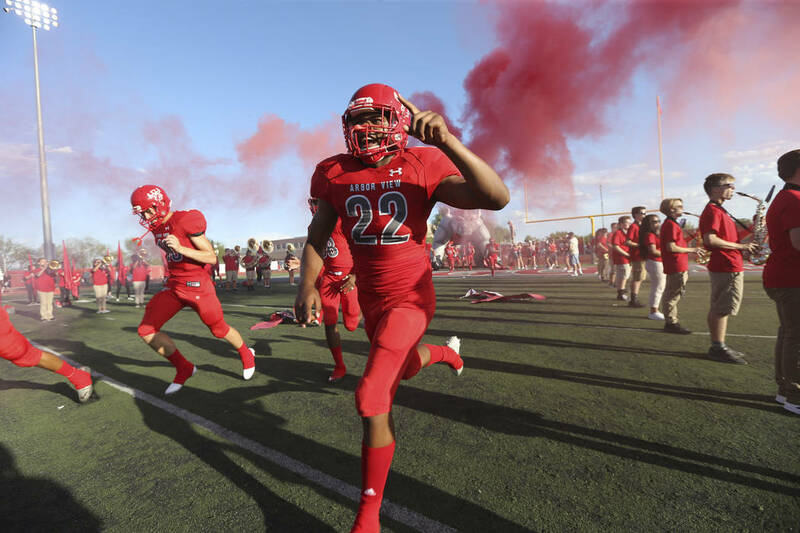 Friday — Hamilton (Arizona) at Arbor View, 7 p.m. The Aggies have knocked off the first two out-of-state opponents on their schedule. Now they face one of Arizona’s traditional powers in Hamilton. Friday — Lone Peak (Utah) at Liberty, 7 p.m.
Locals will get their first look at the second-ranked Patriots, who opened their season with a 22-12 road win at Saguaro (Arizona). Tuesday — Southeast League match at Legacy Golf Club, 11:30 a.m. The first look at the four-time defending state champion Coronado comes Tuesday in a league match. The Cougars are one of the favorites for the state title again this year after. Monday — Palo Verde vs. Durango at Green Valley, 6:30 p.m. The championship game of the Southern Nevada Kick-off Classic, it will give a nice confident boost to whichever team comes out on top. Palo Verde defeated Faith Lutheran in last year’s championship game. Tuesday — Desert Pines at Spring Valley, 3 p.m.
Desert Pines was a force in Class 3A last season, and Spring Valley is just one season removed from a trip to the 4A state tournament. This will be a nice benchmark test of where these programs stand in the pecking order. Monday — Coronado at Palo Verde, 3 p.m.
Two of the better programs in Southern Nevada meet in an early test this season. The Cougars have reached the Sunrise Region title game eight years in a row, and Palo Verde lost to eventual state champion Bishop Gorman in last year’s Sunset Region playoffs. Friday — Las Vegas Kick-off Classic final at site TBD, 2 p.m. The girls side wraps up its early-season tournament, where teams from across the valley will play at Green Valley and Palo Verde all week to determine who meets for the title. Tuesday — Centennial at Faith Lutheran, 3 p.m. The Bulldogs travel to face the Crusaders for an early Mountain League match. Both teams had winning league records last year, and Faith Lutheran nabbed a 10-8 victory in their 2017 matchup. Tuesday — Clark at Green Valley, 3 p.m. The Chargers and Gators each won 10-plus matches last season and return strong singles players and doubles pairings. Tuesday — Palo Verde at Silverado, 6 p.m. The Panthers head across town for a nonleague game against the Skyhawks. Both teams won more than 20 matches last season. Wednesday —Shadow Ridge at Coronado, 6 p.m. The Defending state champion Mustangs head to Henderson for a date with the Cougars, who qualified for the Class 4A state tournament a year ago.